On a recent trip to Pittsburgh for Quilt Market, Amber and I each came home with a 1/2 meter bundle of the newest Nani Iro double gauze collection. We had been coveting these types of bundles for years and finally took the plunge to owning them ourselves. 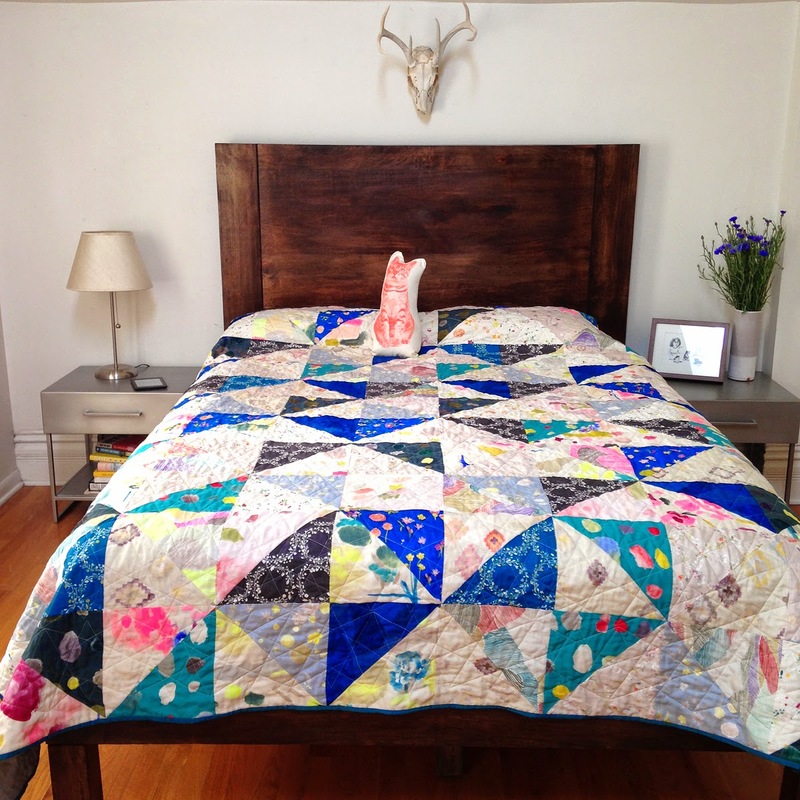 There was only one thing to do with this: a Nani Iro double gauze quilt. Size Made: queen - 90" x 96"
OMG these prints! Super subtle creams and whites, pops of neon and then saturated blues and teals! All with hints of metallic ink on yummy double gauze base fabric. Swoon! You really can't go wrong with this collection. 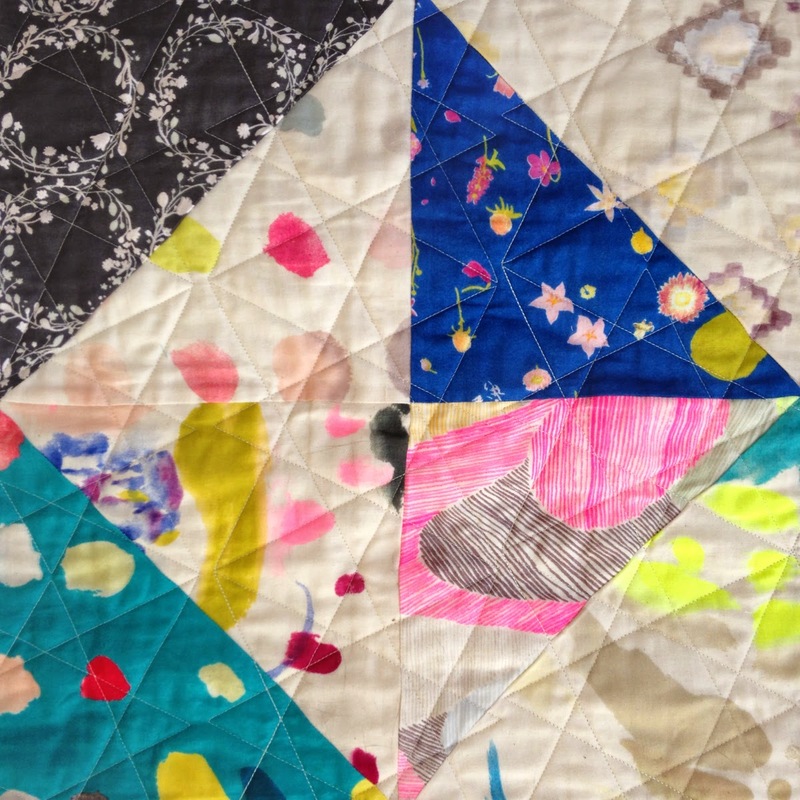 Any way you dice it, a double gauze Nani Iro quilt is going to look stunning. I didn't want to break up the beautiful prints too much so I cut 10 1/2" squares as the base of my half-square triangles. Once I pieced these together, I laid them out in a random pattern - working to break up the saturated colors with the delicate creams. I think the result is amazing, I love this quilt. I made up this pattern, which is really just a random assortment of half square triangles (HST). I used the easy HST method of layering fabric squares, stitching them on the diagonal and then cutting them in half, creating two blocks each time I did this. This brilliant method means you don't have to stitch cut bias edges which could stretch. For the back I simply pieced together my leftover strips from cutting my squares and combined these strips with a chambray voile. 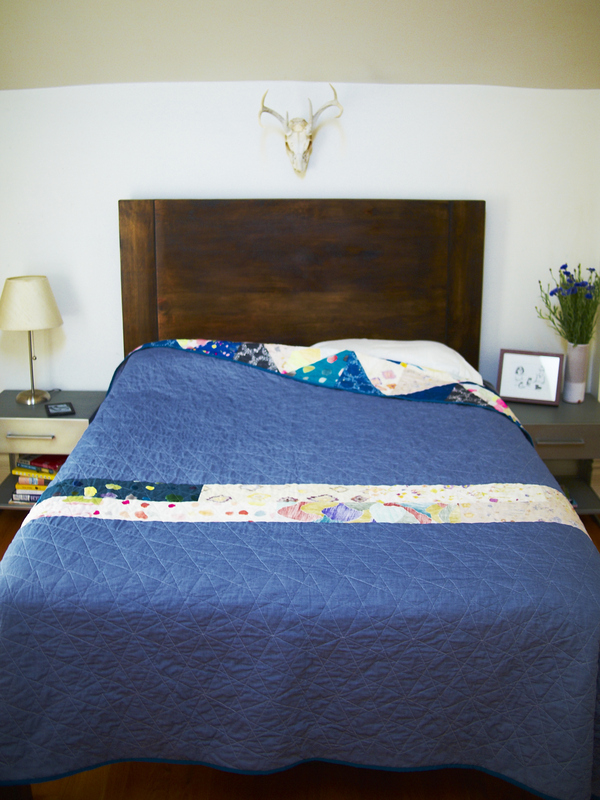 I used our thinnest weight cotton batting so this is the lightest, airiest, summery quilt of all time. 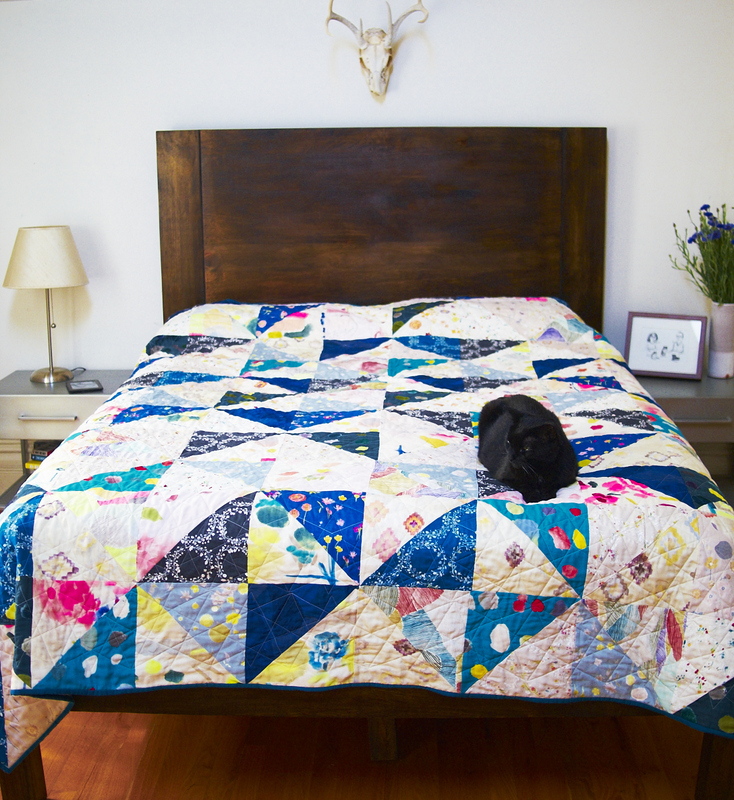 Like all my queen-sized quilts, I had this one quilted professionally by Jason of Secret Stash Quilting. We just did a basic panto-gram design in a geometric triangles grid. The quilting echos the front of the quilt, but the light thread makes it disappear on most of the quilt top. I finished it with a bright teal shot cotton binding to frame the quilt and bring out the teals and bright blues of the Nani Iro. 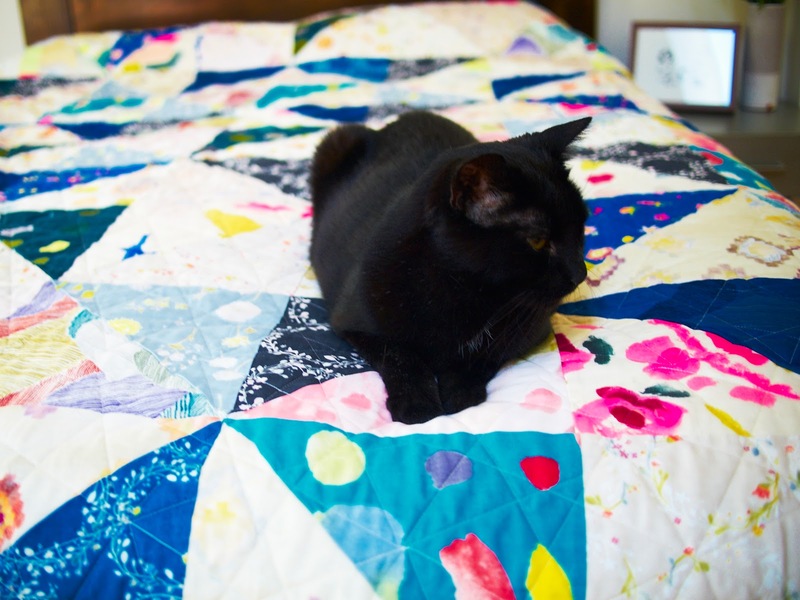 We still have a few half-meter bundles left if you're dreaming of a Nani Iro quilt of your own. Trust me, you won't be disappointed!